Palomar Vectus Laser Review | Features Comparison | LOW PRICES!! Our Vectus Laser Review looks at key features of this popular laser hair removal system and compares the laser to other diode laser hair removal systems available for resale. Let’s start with the basics of the technology. Palomar’s Vectus is a near-infrared diode laser system that is designed to perform high volume hair removal in a fast, uniform, and permanent manner. Focusing on patient comfort and safety, the Vectus is uniquely qualified to best perform hair removal on a wide range on skin types. The keys to success for the Vectus include its speed and its efficacy – both of which derive from its technological ingenuities are superb. The speed of treatments relates directly back to the Vectus offering the largest spot size of any comparable machine. The small sapphire optic hand piece measures 12 x 12 (144mm2) and the large sapphire optic hand piece measures at 23 x 38 (874mm2). 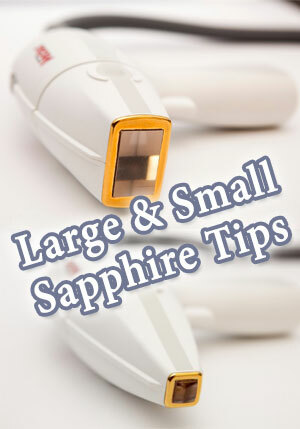 Use the Large Sapphire Tip to cover large areas like backs and thighs. Use the Small Sapphire tip for harder to reach places. Skintel Melanin Reader technology is the only technology of its kind and it removes guesswork from hair removal procedures. While most machines require professional judgement and test spots to determine treatment fluence, the Vectus uses Skintel to measure how the skin of a patient diffuses reflectance at three unique wavelengths of light. Those measurements are used to gauge the melanin index (MI) and the MI corresponds to specific test spot fluence that can then safely be used on the patient. The provider simply takes three sample measurements near the treatment area to determine an average that is then sent wirelessly to the Vectus device. As a final step, the provider enters client data – including hair color, hair diameter, and hair density – and the system is then ready to successfully treat skin types on the Fitzpatrick scale of I to VI. While Skintel technology speeds up the process of combining skin-type with treatment, the uniform beams emitted from the two different hand piece options help reduce hotspots. Other devices can cause hot spot-related scarring and burning when a collection of heat develops within the hand piece window, but the Vectus sapphire optic hand pieces provide even heating across the treatment windows, avoiding the occurrence of hotspots. The Vectus also offers advanced contact cooling technology which provides a unique coolant flow pattern for pre, during, and post-treatment cooling. This provides the ideals of both maximum comfort and minimized risk to all patients. In addition to the Skintel technology, the uniform beams, and the cooling technology, photon recycling rounds out the advanced efficacy of the Vectus by maximizing treatment results and reducing energy loss. The secret is found in highly reflective mirrors which are placed inside of the lamp to send reflected photons of energy back into the treatment area. This essentially takes unnecessary strain off of the device and can increase available fluence to heat the target to nearly double. Continuing with our Vectus laser review, another important factor in the system’s popularity is that the Vectus Laser also offers patient and provider-friendly features that make it an easy-to-use option. One such feature is the easy-to-read screen interface that guides users to success. Broken up into a quadrant design of hair density, hair diameter, hair color, and Fitzpatrick skin type (determined through Skintel), the LCD screen provides foolproof examples, removing the guesswork from operation. Another such feature is the SmoothPulse technology that removes the risk of “spikes” caused by an excessive rise in epidermal temperature. While other devices often see spikes occurring – resulting in discomfort and possible negative side effects – the Vectus’ SmoothPulse technology ensures that spikes don’t appear and the temperature remains at consistent levels through the duration of treatment. Additionally, the Vectus does not require any disposables for operation so the cost remains low with regard to operation of the machine and maintenance is straightforward as well. While most cosmetic laser repair services should be performed by a professional, it is recommended that all Vectus devices receive an annual calibration and periodically the chiller fluid, air and chiller filters, and fuses may need to be replaced. Both are simple processes and can be done in house following the directions on the screen display. Our Vectus Laser Review would not be complete without a comparison of other top selling laser hair removal systems. In a market comparison with similar devices working with hair removal, the Vectus demonstrated superior performance in terms of speed, comfort, and cost. Presented with the same surface area and components, the Vectus completed treatment in less than half the time it took for the LightSheer Duet and in less than one-sixth the amount of time it took Candela’s GentleLASE. This is likely because the Duet and GentleLASE’s spot size options max out at 770 mm2 – far smaller than the Vectus’ large sapphire optic of 874mm2. Also, due to the spikes presented by sporadic heating, the LightSheer Duet and GentleLASE both are far more prone to hot spots which result in patient scars that can be painful and upsetting. Those factors coupled with the extended cost of consumables for the other devices – GentleLASE Cryogen runs nearly $50 per canister and the LightSheer Duet requires up to six inserts per treatment at $8 per insert – prove that Vectus is the more sound option for regular patient treatment. For more in depth information on the Vectus, visit Cynosure’s website. Yvonne Coleman, has been involved in the medical laser industry for nearly a decade, specializing in aesthetic and cosmetic laser equipment for dermatologists, plastic surgeons, medspas,and aesthetician.